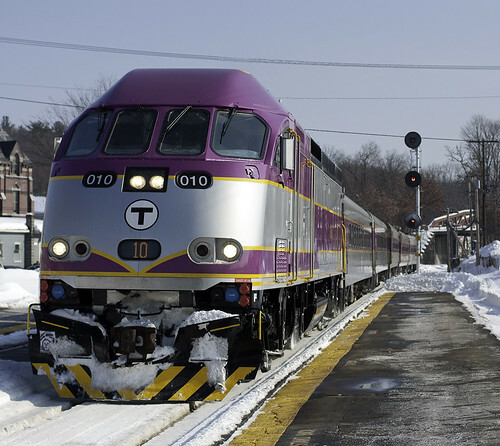 With this winter's delays on the commuter rail, it's clear that legislators and MBTA and MBCR administrators need to push harder for better infrastructure and the funds with which to furnish it. But let's take a look at an issue that comes up every once in a while. Despite the MBCR's best efforts at preventing boarding and alighting accidents, through policy or physically securing doors, these accidents happen. In the winter, steps that accumulate ice from billowing snow kicked up as the train moves along can be a liability for passenger accidents and hampers boarding and alighting efforts, even increasing boarding times as people take their time to prevent slips and falls. I'm down on Long Island for a few days and I'm quickly remembering what fast, frequent, and convenient commuter rail service is like. I can take a train from Penn Station to my parents' stop out in Wantagh, over 50km or about the distance from Boston South Station to Worcester, and reliably be there in 1 hour. Trains on my branch run every 30 minutes to every hour, depending on time of day. This is not only because the electric M-7s the LIRR runs have better acceleration rates than diesel trains, but also because of how passengers can get on and off of the train. When visiting most any other commuter railroad in first world countries or even our neighbouring commuter railroads to the south, the contrast is very clear. Passengers board and exit at any door along the length of the train from automated doorways that sense obstructions and prevent the train from moving if any of them are open. This is how heavy rail transit, like the Red, Orange, or Blue lines, operate (except when rollingstock on rapid transit is also so old that door sensors don't sense when people or objects are caught). The top two commuter railroads, Metro North and Long Island Railroads, only have high-level platforms like those pictured above. On the MBTA network, very few stations have full high-level platforms and many have portions that exist only to make the stations ADA-compliant, the construction of which has been furnished by MBTA a multi-year, $1+ billion ADA compliance project. Even if the Legislature and federal grants furnished the money required for the MBTA to raise its platforms, newer passenger cars (rollingstock) would still need to be purchased in order to fully seize the benefits of high-level boarding. The current and on-order bi-level cars have the latent ability to coordinate closing and opening of doors along the length of the train. Almost none of the older single level cars have this ability; conductors would need to go to every door to open and close them, otherwise lock doors in place to prevent the train from moving with open doors. Newer commuter rail trains also benefit from the flexibility of having doors not located at end vestibules in order to allow passengers to board and alight more quickly since doors are more evenly spaced along the length of the train. 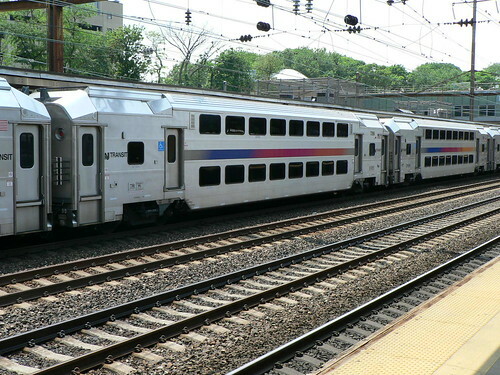 New Jersey Transit's bi-level cars have 'quarter-point' doors, which sit over the trucks (the sets of wheels on a train), in addition to the conventional vestibular doors with 'trap doors' that permit low-level boarding. This isn't the most optimal door configuration, even for bi-level cars, but permits greater flexibility for passengers who are boarding or alighting at high-level platforms. Aside from platform improvements, a capital expense that would likely cost tens of millions to billions to complete, depending on engineering practices and station geometries, there are several changes inside trains that can happen, namely electronic fare payment. The CharlieCard is now three years late in arriving on commuter rail and I quite frequently still see tweets of people thanking the MBTA for not coming to collect their fare on the train. 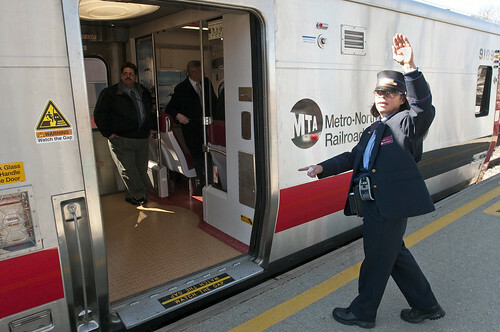 If you look at the conductor in the lede photo, you'll notice a small grey device on her belt - all Metro North conductors are equipped with one. This is a portable electronic ticketing machine and allows her to process credit and debit cards so passengers can pay for their fare without juggling cash. It is likely these machines can be upgraded to validate fare with RFID cards or future NFC technologies that the MTA is currently exploring with the MBTA and other regional transit operators. With deals and decisions to be made in the coming years, it's likely the MBTA and others are cooling their heels and waiting for a standard to come in before purchasing soon-to-be-outdated portable fare collection equipment. Long Island Railroad was promised these handy devices in about the same time as the MBTA Commuter Rail, but LIRR conductors still don't have them. When all is said and done, both raising platforms, reconfiguring stations, and procuring portable fare collection devices will cost money, admittedly money no one seems to have, most especially the MBTA. Though, let's remember that these are expenses that fall under the capital budget, which is almost exclusively furnished by MassDOT, state grants, and federal grants from USDOT funding programs and other agencies. Much of these capital expenses can also be covered by investments from the private sector in the form of associated transit improvements to improve the appeal of or as part of transit-oriented developments around commuter rail stations. These improvements need to happen in order to improve safety and running times of commuter rail trains, which already suffer from conditions not seen anywhere else in the burgeoning metropolitan regions of the Northeast Megaregion. Note: MBTA Commuter Rail trains do have to make one accommodation that LIRR, Metro North, and most NJ Transit trains don't - MBTA shares many of its tracks with long, slow-moving CSX trains that are also important to Boston's economy. It will take a much greater amount of infrastructure investment to solve that problem, but that isn't to say DMU or EMU operation of MBTA Commuter Rail trains wouldn't improve service.